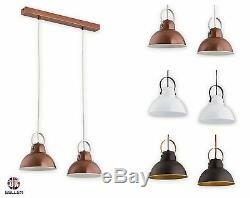 Industrial style pendant lights - Ayla. 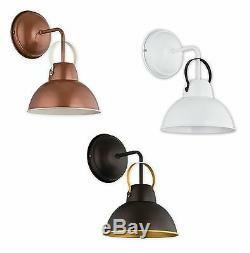 Metal light shade and 3 different finishes: White, Copper & White, Wenge & Gold. Fitting is made of steel with fabric flex wire. With fixings and instruction manual. Check our other items for full range of Ayla lights including wall lights. # 1 Light BIG: 30-110cm. # 1 Light SMALL: 30- 100cm. # 2 LIGHTS: 30- 90cm. # 3 LGHTS: 30- 80cm. # WALL LIGHT: 29.5cm. # 1 Light BIG: 37cm. # 1 Light SMALL: 19.5cm. # BIG SHADE - 37cm. # SMALL SHADE - 19.5cm. Bulbs: E27 big screw - not included. Suitable for use with low energy bulbs - LED, CFL, halogen. Max wattage: 60W each bulb. 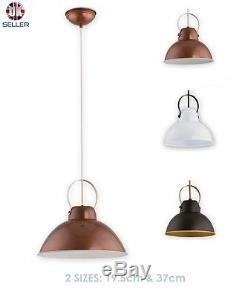 Copper finish means the light fitting and shade are covered with paint similar to copper colour - IT IS NOT REAL COPPER. We can send you close up pictures of the colour if you need to match the lights to your home interior. Fab Home Interiors first appeared back in June 2011. Since then the company is firmly committed to providing all customers with very best products along with the customer service they deserve. Northern Ireland: All postcodes containing BTIsle of Wight: PO30-PO41. We use the best couriers available to us to ensure that your product is received on time and in great condition. Please ensure that someone is available to sign for the item as signatures are required. Please note that customers are responsible for the return costs of unwanted items. 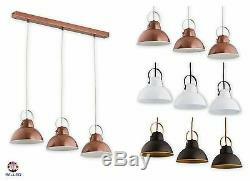 The item "Pendant Ceiling Loft Light Vintage White Copper Wenge Industrial Retro Fitting" is in sale since Saturday, March 5, 2016. 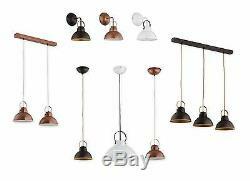 This item is in the category "Home, Furniture & DIY\Lighting\Ceiling Lights & Chandeliers". The seller is "fabhome2011" and is located in Newcastle upon Tyne. This item can be shipped to United Kingdom, Austria, Belgium, Bulgaria, Croatia, Cyprus, Czech republic, Denmark, Estonia, Finland, France, Germany, Hungary, Ireland, Italy, Latvia, Lithuania, Luxembourg, Malta, Netherlands, Poland, Portugal, Romania, Slovakia, Slovenia, Spain, Sweden, Australia, United States, Canada, Brazil, Japan, New Zealand, China, Hong Kong, Norway, Indonesia, Malaysia, Mexico, Singapore, South Korea, Switzerland, Taiwan, Thailand, Chile, Greece, Israel.